Auric Road – the hotel group behind cult Palm Springs favourite Korakia Pensione – has opened a new property, Hotel Joaquin, which is tucked away in Shaw’s Cove, a secluded enclave with a laid-back island vibe in Laguna Beach. 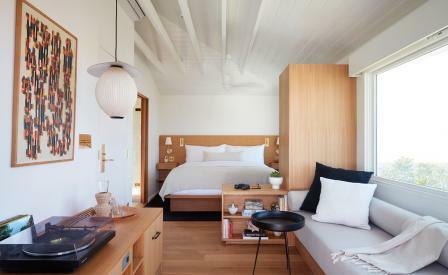 Occupying a traditional California bungalow, with white horizontal wood shingle and natural textures that will grow old gracefully, Hotel Joaquin has been designed by New York-based Robert McKinley who took his cues from the soulful French style of St. Barth’s and the 1950s Southern California beach culture. The public spaces and the 22 guestrooms are dressed with vintage pieces, books, record players, custom furniture and curated artwork – by coastal-driven local artists like Sage Vaughn and Danny Fuller. Open ceilings with exposed rafters, add to the relaxed charm. Meanwhile, woods are oiled white oak rather than varnished finishes, brass fixtures have a natural patina and reclaimed local terracotta is mixed in with Moroccan and Mexican tiles. At Saline, the all-day Mediterranean inspired restaurant, Argentine chef Leo Bongarra serves up dishes like the cous cous and crab with turmeric and a poached egg or an octopus carpaccio, all accompanied by an international salt programme.